One of the great things about working with WordPress is the huge wealth of freely available content online covering just about anything you might want to do with WordPress. Got some weird php error after upgrading one of your sites? Chances are you won’t be alone and a simple Google search will solve your problem in a couple of minutes. Want to know about how to optimise your WordPress site for millions of pageviews? Yip, theres tons of stuff online about that too (including *cough*) But sometimes there’s nothing like sitting down and immersing oneself in a really well written book to take you beyond specific problems and queries and broadens your horizons a bit. Tons of books have been published about WordPress in recent years, catering from the absolute beginner to the wannabe rock star theme developer. To be honest, there’s also been some pretty crap ones too. Here’s a selection of the best WordPress books that will help you deepen your WordPress skills in no time. Lisa is well known in the WordPress community for putting in a massive amount of time to create the definitive go to resource for newbies getting to grips with WordPress for the first time. If you’ve been using WordPress for some time now, this book might be a little bit too high level for your needs. But don’t discount the dummies tag, this book covers just about everything one would want to know about to get the most out of WordPress. Lisa’s writing style is very easy going and you’ll fly through this book in no time. We’ve been promoting this one for a long time. Digging into WordPress is for anyone who wants to build their own WordPress site from scratch. The book has regular updates which are published shortly after new WordPress versions are released. The scope of the 400 page book is very broad, covering themes, plugins and a whole load of other WordPress tidbits like rss customisations, search engine optimisation and comment management. This one will take from WordPress novice to competent website maker in no time. Oh and if you choose to get the hard copy version it’s a damn fine looking book! Smashing Magazine are one of the juggernauts of the online world and when they go and publish a book on WordPress one expects Smashing to deliver. In this case, they most certainly did. 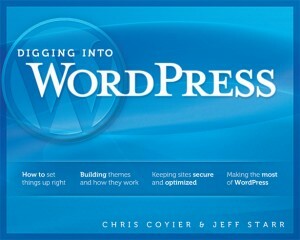 Many people have gone on record to say that this is the best mid level WordPress book out there. This is NOT a beginner WordPress book. Mind you if you’re a stickler for details you might be disappointed to find some typos and grammar errors throughout. If you find a way to get past that, what you’ll find is an embarrassment of WordPress riches covering many intermediate topics in great detail including child themes, plugin development and everything you need to fast track your WordPress development skills. You might have noticed that the books on this are getting increasingly advanced. Well that’s no accident and this last book is the go to resource if you want to become a world class WordPress developer. Brad, Ozh and Justin are all really well known guys in the WordPress community and while this book is primarily targetted as plugin developers, I found this book to be excellent for advanced theme developers aswell. Modern theme design is becoming increasingly a development task rather than a conventional design task and in that regard Professional WordPress Plugin Development is a must have for anyone writing a single line of code to do with WordPress in 2012. This book will not be for everyone – if you never see yourself writing WordPress code – save your money. If you are evening thinking about developing for WordPress save yourself hundreds of hours on Google and get this now.